This app comes with 10 stories, each with an accompanying lesson for the four target concepts. The stories are engaging, an cover a variety of topics. There is also a feature in this app that allows you to create your own stories and lessons, complete with questions and answers. You can even use your own pictures. To begin this app, you can simply press the Start a Lesson button. If you press the settings button, you can change the Text-to-Speech option, and find out more about Everyday Speech. Next, you will chose the lesson type you want to work on (Vocabulary, Sequencing, Categories, Opposites) and your story choice. The first lesson I chose was vocabulary. To listen to the story, you press the speaker button. When you are done reading or listening to the story, you can press start to begin the quiz. The questions are multiple choice with three choices. You can hear the question and answers by clicking the speaker button. When your student chooses the correct answer, you will get a box that says, "That's Right!" You can then proceed to the next question. If your student chooses incorrectly, a box will pop up with "Incorrect" written. You can then choose to review the question or proceed to the next question. When you get to the last question, you will get a data collection page which marks the correct number of answers by coloring in stars. You can then click Complete Lesson which will take you back to the main menu. You can also click "Add Skill Set" to add additional lesson areas. I think I would create a "Wh" question section for my stories. I like the vocabulary, categories, and opposites lessons of this app. It think the questions are great, and will work really well with my students. I also like the option of being able to add my own stories and pictures. I think that will be really great with some students I am working with that are focusing on relaying information from past experiences. I could see using real pictures for these stories, and have the students answer questions about their experiences. The voice is very robotic because it uses text to speech technology. I think that if it were possible to have real speech and be able to record your own voice for the story, it would be a great addition to the app. In the sequencing lesson, students are able to tell from the picture what the answer is. It would be great to be able to turn off the picture on this part of the lesson. One last thing that would make this app great would be to have some data tracking for students. 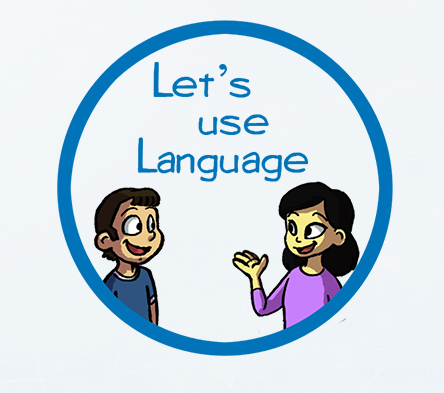 You can get Let's Use Language: Basic Language Development on the iTunes store for $14.99, or you can enter to win a copy here! Just enter in the rafflecopter below for a chance to win one copy of this app. **I was provided a copy of this app for review, however was not compensated in any way for my review.